Hair restoration or hair transplant techniques are those that are used to extract hair follicles from donor areas (usually the back of the head) and implant the follicles in balding or thinning areas of the head to restore uniform hair growth. 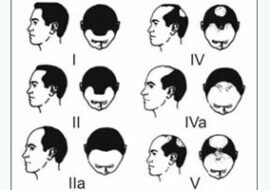 Hair transplantation has evolved over the years and there are a number of techniques that have come up and replaced as more knowledge in this field was gained. Punch graft method – this method used a 3-4 mm punch tool to remove a cylindrical graft of hair-bearing skin from the donor area. This graft which contained approximately 20 hairs was then transplanted by placing the grafts in holes made in the recipient area. This procedure left large circular holes all over the donor area which were then sewed shut or allowed to heal naturally. 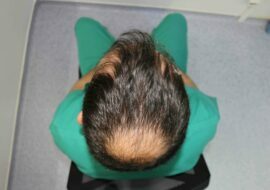 This practice was largely abandoned owing to the fact that it left extensive scarring the donor area and the transplanted hair looked unnatural. Mini/micro grafts – In the 1980s, the punch graft method was largely discarded and replaced by mini or micro-grafts. These were tiny strips of hair harvested from the donor site then transplanted by placing them in a very small slit made in the balding area. This method was a welcome improvement from the doll-like hair clumps seen after a punch graft. However, the restored hair still didn’t resemble the original appearance. and the quality of the hair. This strip could range from 1.5cm to as long as 30cm. After excision of the strip, the donor site is sealed then the surgeon microscopically dissects the strip to extract the follicular units. These individual follicles are then transplanted into the recipient area. 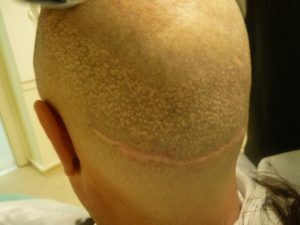 This procedure caused linear scarring compared to its predecessors and the scar left by the strip in the donor site could be hidden by the patient's remaining hair thus preserving their dignity. This coupled with the fact that the result was natural-looking hair ensured FUT gained a lot of popularity until the Years 2014-2015. Today the ratio FUT vs FUE is around 20:80. So there is no advantage to offer FUT for the most Hair Transplant Clinics. A combination of FUE Hair Transplant, Body Hair Transplant and Scalp micropigmentation can avoid a FUT surgery. 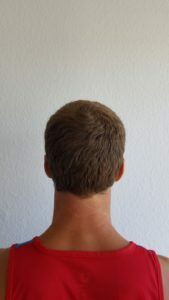 instead of obtaining follicular units from a strip of hair as seen in FUT, the follicular units are directly harvested from the donor area then implanted into the appropriate site. 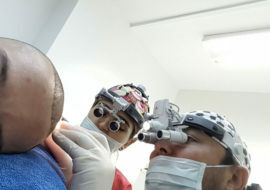 In this procedure, the follicular units are painstakingly extracted one by one from the donor site which makes it very time-consuming compared to FUT. Furthermore, the donor area must be shaved for the follicular units to be harvested which is a sore point for many. What makes FUE Hair Transplant the most superior hair transplant technique is that it is minimally invasive with little to no scarring. The final result of the procedure is virtually indistinguishable from the original hair growth. This procedure continues to advance as surgeons acquire more experience in the field and new specialized surgical implements are made. These specialized tools make sure that smaller punch holes are created, as a result, scars disappear in a matter of days. There's also some progress in the development of robotic FUE procedures that if successful, could automate the time-consuming harvesting of follicular units that makes the procedure so expensive. FUE is definitely the gold-standard of hair restoration techniques and may only get better with time.